The ConceptDraw DIAGRAM is a good flow chart app for Mac. Numerous vector stencils, samples and templates created by designers allows you to draw any type of flowchart. Flowcharts give to users the ability to represent structural data visually. Sample 1. Flowchart sample: Product life cycle process. 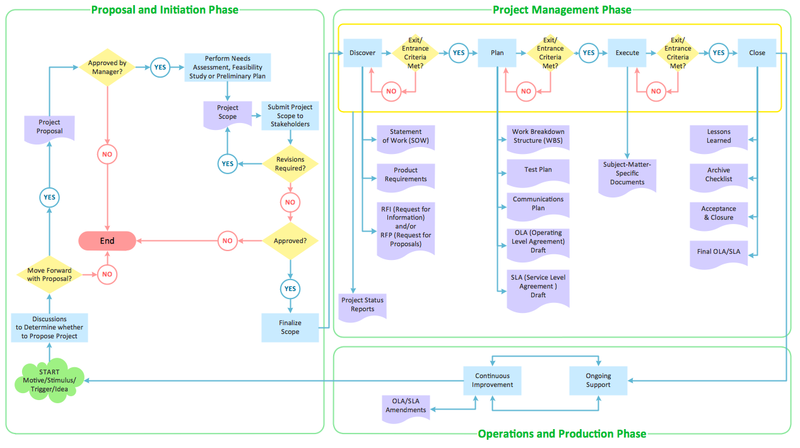 This project management flowchart example visualizes product life cycle process. Create flowcharts in a breath with Cubetto Flow on your iPad and iPhone wherever you are. Human Resource Development (HRD) focuses on the help employees develop their personal and organizational skills, abilities, and knowledge, HRD also helps to adapt an organization to the changing of external environment. ConceptDraw DIAGRAM v12 diagramming and vector drawing software supplied with HR Flowcharts Solution from the Management Area of ConceptDraw Solution Park can effectively help in labour-intensive process of human resource development. Army flow charts provide an easy visual layout with a systematic approach for dealing with army issues.